This is a serious course for the plant enthusiast, collector, nurseryman, landscaper or aspiring horticulturist. Course developed by a team of experts led by John Mason, nurseryman, parks director , author of Growing Australian Natives" (pub. Simon & Schuster) and over 40 other books. We mostly use Australian plants as garden specimens but they have many other valuable domestic and commercial uses. In the home garden we grow native plants to attract birds and wildlife. Native plants are also grown for their distinctive flowers, foliage and fruits which are highly valued by florists and craftspeople. Other useful products from native plants include essential oils, bush tucker and timber. NB: Tree Identification is an important part of this course. You will develop a systematic approach to tree identification based upon a knowledge of plant families and the taxonomic system. To describe the culture of Australian Native Trees. To compare characteristics and cultural requirements of conifer and rain forest species of Australian Native Trees. To describe a range of uses for Australian native trees. To study one type of Australian Native Tree in depth. Australian trees are diverse, and include many valuable species. Some are valuable as landscape plants forestry trees or for conservation purposes. Others have uses you might not have even considered. Hundreds of different plant species were used as a food source by Australian Aborigines. Nowadays we are familiar with just a few of those plants, although interest in bush tucker is undergoing a revival of interest as both home gardeners and commercial growers are discovering the diverse range of edible native plants. The best known edible native plants are macadamias and Davidson’s plums, both of which grow naturally in subtropical rainforests along the northern coast. The ‘bush nuts’ (Macadamia integrifolia and M. tetraphylla) once gathered by Aborigines are now rare in the wild but have been bred for a number of years (mainly in Hawaii) to produce superior varieties that are grown in large commercial plantations. Trees grow 12 to 15m but smaller grafted varieties are available. The trees are slow-growing and require deep, well-drained and enriched soil. They need a protected position as they are sensitive to frost, winds and drying out. The nuts can be eaten raw or roasted. Davidson’s plum (Davidsonia pruriens) is an attractive small tree that produces a sour plum-like fruit. The fruit are used to make jam, conserves and wine, and as a flavouring in sauces and drinks. The tree requires shelter from winds and frost, and adequate water during the growing season. Some bush tucker plants are harvested from the wild but as demand is increasing more varieties are being cultivated. Most bush tucker is minimally processed or value-added (for example, as dried spices or in sauces); only very small volumes are sold and consumed as fresh produce. Quandong (Santalum acuminatum): A shrub or small tree with a wide distribution in semi-arid regions of southern Australia. The tart-tasting fruit can be eaten fresh although it is more commonly dried and then reconstituted for use in sauces, preserves, chutneys, liqueurs and dipping sauces. Lemon myrtle (Backhousia citriodora): A rainforest tree that grows to 15m in its natural environment. The leaves have a strong lemon scent and are used to flavour a wide range of sweet and savoury foods. They are also used in non-food products such as cosmetics and household cleaners. Desert lime (Citrus glauca) A small tree to 2-4m tall with small green to yellow fruit. Finger lime (Citrus australasica) A rainforest tree to 10m bearing oval green to yellow fruit. Round lime (Citrus australis) A rainforest tree that grows 3-10m tall, with rough-skinned green to yellow fruit. Native trees are grown and harvested to provide building and furniture timber, fencing and pole timber, pulpwood, firewood and fodder. 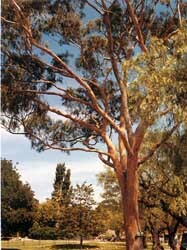 The best known Australian native trees, the eucalypts, are grown extensively for timber and paper pulp production, both in Australian and overseas plantations. Their main disadvantage is the long period of time required to produce a harvestable crop. For example, mountain ash (Eucalyptus regnans) typically takes more than fifty years before it can be harvested. Other species, though, can produce commercial timber in a shorter period; for example, spotted gum (Eucalyptus maculata) can be harvested in less than twenty years. 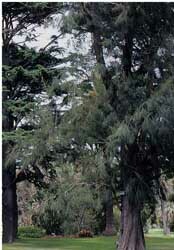 Blackwood (Acacia melanoxylon) and black wattle (A. mearnsii) have potential as timber for furniture, joinery and pulp. They are also excellent for controlling erosion. Both require adequate rainfall to be suitable for use as timber. In subtropical and tropical areas, the main plantation timber is the Hoop pine (Auracaria cunninghammii), although other rainforest trees, such as red cedar (Toona ciliata syn. T.australis), coachwood (Ceratopetalum apetalum) and Crows ash (Flindersia australis), are also regarded as important timber species. In drier, inland areas, valuable native timber species include Callitris, Casuarina, ironbark (Eucalyptus sideroxylon), river red gum (Eucalyptus camaldulensis) and Acacia. The flavour and fragrance of scented plants such as lemon myrtle, eucalypts and boronias is due to the aromatic compounds in their flowers, leaves and bark. When these are extracted by distillation, the resulting product is a volatile, colourless, oil-like material. Essential oils are used in food flavouring, and in the cosmetics, pharmaceutical and fragrance industries. Two native plants are harvested commercially for their essential oils: eucalypts and tea trees. Eucalyptus oil is mainly extracted from the blue mallee gum (Eucalyptus polybractea), a deep-rooted tree from the mallee regions of Victoria and NSW. The oil from this tree is used in inhalants, soaps, lozenges and other medicinal products. Other species used to produce medicinal oils include E. globulus, E. dives, E. sideroxylon, E. viridis and E. leucoxylon. Eucalypts used to produce industrial oils (to make disinfectants and industrial cleaners) include E. dives, E. radiata and E. elata. The lemon-scented gum (Corymbia citriodora syn. Eucalyptus citriodora) has been used to supply citronella oil. The production of eucalypt oil has a long history – the first eucalypt distilleries were operating in the early days of colonial settlement. Tea tree oil is mainly extracted from a small paperbark tree (Melaleuca alternifolia) that grows naturally in damp soils in northern NSW and Queensland. Oil production commences in 12-18 months after planting, and the harvest continues on a 12-18 month cycle for up to ten years. Other native plants that yield essential oils include the brown boronia (Boronia megastigma), mountain pepper (Tasmannia lanceolata), lemon myrtle (Backhousia citriodora) and native frangipani (Hymenosporum flavum). You will learn to identify a lot more Australian native trees and understand how and why they might be grown. Your awareness will deepen and broaden; and your value to employers or clients in horticulture, forestry and land management will have grown. Some graduates will use what they learn to enhance a business or career path they are already on; while for others, this course will become a starting point to develop a lifelong passion.